Driving Miss Donna: A Little of This - A Little of That! A Little of This - A Little of That! Well our big destination for this trip was Texas. After our experience trying to get to San Francisco and taking a few years to get all the way, we were wondering. But what happened back then when we started setting destinations is that everywhere we went was new. So it was fine to say let's go to San Francisco but with working traditional jobs and only getting so much time off, and adding stopping at all the amazing places along the way, it took longer than expected. At that point we kind of stopped planning our trips too much. We would head south but not really have a final point in mind. If you asked us we would tell you some name or destination, because folks seem to need to know "Where are you going?" I think it was a comfort level. Anyhow, back to this trip. Let's just say Texas is a long way from home. And we did set up an expectation for ourselves this time. We could stay in several places along the way, familiar to ourselves and favorites, but we knew we had to push a bit and actually get to Texas. We will call this trip our scouting adventure. Stopping in places along the way and deciding would we would want to come back, or just saying "Yup we've been there"! So for our first adventure we picked a stop in Anthony New Mexico, just miles from El Paso. As with any urban area it is hard to differentiate the boundaries between cities and towns in a densely populated area, and in this case states as well. Hence we say we stayed in El Paso but really it was Anthony, and not Texas but rather New Mexico. LOL. 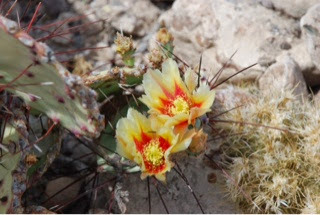 Although our stay in El Paso area was brief, it was a great stop and an opportunity for some intense mountain hiking. Now we didn't expect the intense part, even if we were hoping for a challenge, but we must go with the flow! And once you start up no sense in going back. The reward was an amazing view of the entire El Paso area. And an invigorating way to log over 14,000 steps. We found out all that walking and working out is paying off. Although the altitude was a bit lung wrenching for me we made it without any real issues, having packed appropriate water, etc. Don is a bit more seasoned than I am at hiking, being that he does that all winter long at work. Myself I'm a city girl pavement pounder, or as you know mall walker! Here is a photo of a part of the trail, so well as the foliage we saw. 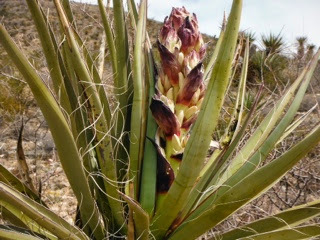 Besides the excellent hike we did encounter a couple of oddities. El Paso is VERY close to the Mexican border. We are used to seeing Border Security, but this was a bit cooler. 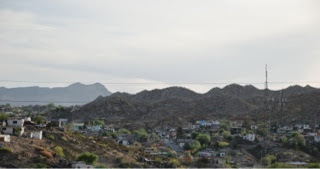 The town of Juarez, Mexico is directly across the border which in this area is the Rio Grande area. It was neat to see the Mexican influence in that town as compared to the western flair of El Paso. Think of one side of the north Saskatchewan in Edmonton being a whole different culture and architecture than the other. Also note the fence on the border. I think if you zoom in you will se Border Patrol also. The second picture shows some different colored houses. Also we attempted to hike at Heuco Tanks State Park, but you had to reserve a spot as they allow a minimum amount of people in at a time. And they recommended 30 days advance booking! So we missed that. So our next stop was Davis Mountains State Park. 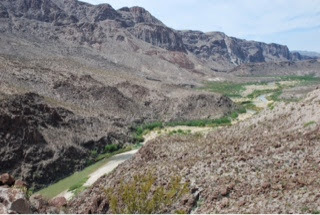 In addition to exploring the immediate area, we were also looking to investigate Big Bend National and State Parks. 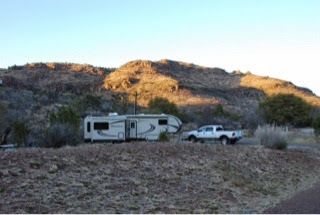 Our site at Davis Mountains was so fabulous. What a beautiful location! 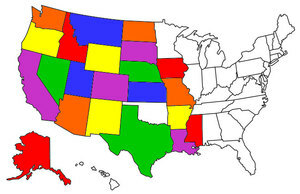 As you already know we quite favor state parks and Texas seems like it will be on that list. We had an opportunity to do quite a bit of walking this time, but did not do any hikes. Quite honestly temperatures were reaching +35 and we are not fans of exerting ourselves at that temperature. So we spent our day in this area driving to Big Bend National Park, via Big Bend State Park. The scenery along the way was again inspiring. 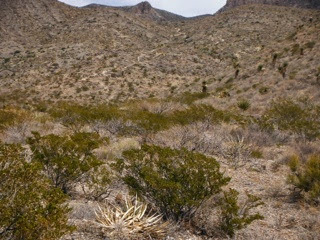 And Big Bend National Park will draw us back, but hopefully in the winter when their temps stay below +30. 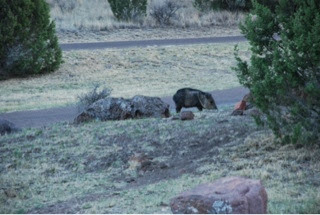 Here's a picture of our campground, a javelina in the site, and the grand valley of the Rio Grande. It was a great day, but then again, when is it not when the trailer is parked in a scenic spot and Driving Miss Donna gets to see new places and spaces. Next report will be from San Antonio! !